A new clip from the directorial debut of Superbad and Pineapple Express scribes Seth Rogen and Evan Goldberg has been released online. 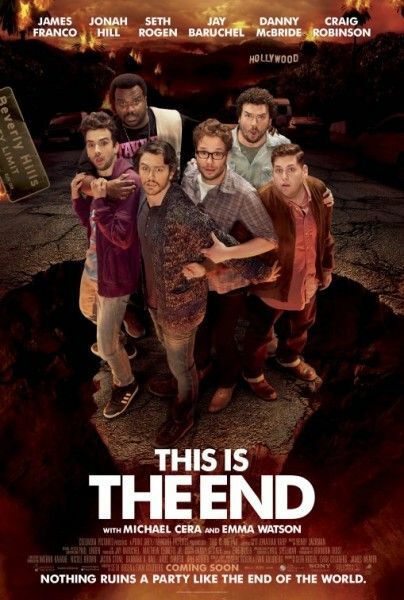 This Is the End stars Rogen, Jay Baruchel, James Franco, Jonah Hill, Craig Robinson, and many more as the actors play exaggerated versions of themselves that are trying to survive the end of the world. The majority of the story appears to take place in James Franco’s house, which serves as the group’s default bunker, and this new clip highlight’s Baruchel’s unwillingness to die at the actor’s house. The film still looks like it’s going to be a whole lot of fun, and if you somehow still need convincing I suggest you check out the hilarious red-band trailer that was recently released. Hit the jump to watch this new clip, and click here for Dave’s recap of the pic’s WonderCon panel. The film also stars Emma Watson, Jason Segel, Michael Cera, David Krumholtz, Paul Rudd, Martin Starr, Mindy Kaling, Kevin Hart, Aziz Ansari, and Rihanna. This Is the End opens on June 14, 2013.